Margins: 5 feet with SA a half length further back third. The eights race was regarded as one of the best seen since 1914. This is interesting because in many cases the crews were not perhaps the best crews from each State. This arose because of the Olympic test race in Adelaide in March 1924, a month before the Championships, when the Murray Bridge crew gained selection for the 1924 Olympic Games. They did not represent South Australia at these Championships. Furthermore, it is clear that some other rowers preferred the test race to the Championships bringing in other rowers for State representation being unable to attend both events. This is evidenced by the larger number of new names present than normal and the presence of key rowers in the test race crews. Despite a false start and delays, the race had action and a tight finish. Tasmania and Victoria led off the start but were rowed through by Queensland after only half a mile. Tasmania, Victoria and South Australia had to negotiate a beacon and themselves which kept them busy and tested their coxswains. New South Wales took the lead at the mile and Queensland fought back by the half way mark. South Australia used the inside lane to perfection and took the lead but were out rowed over the last half mile by both Queensland and New South Wales. The tussle to the line was immense and Queensland passed the line just in front of New South Wales. The winners hailed from the Wide Bay Club, the South Australians from the Mannum Club and the Victorians from the Wendouree Club. The Victorians suffered on four fronts. They broke a rigger pin, were swamped and their bow man received a very nasty injury through being struck by the propeller of a launch. It was later reported in the VRA Annual Report that he fully recovered. Finally before the race, the three man of the Victorian crew R Pierce was unable to row and was replaced by H Inglis of the Ballarat Rowing Club. The NSW coach and manager wanted to drop Hurley from the crew and replace him with F J Hasemer originally from Mosman but then a resident of SA. The South Australians threatened to disqualify them if they did. The coach was reprimanded upon his return to Sydney for this attempted action. However the manager Alderson stated: "There is no doubt that the New South Wales eight would have won the interstate race but for the attitude of the South Australian Rowing Association regarding the use of an emergency. As it was we competed with one member of our crew unfit to row, and were then beaten by only five feet." The sculling race also had its incidents with the Tasmanian sculler Nimmo capsizing half way down the course whilst leading. James Barton of Victoria went on to win by 2 1/2 lengths. The regatta committee met to consider this matter and came to the conclusion that Nimmo could have negotiated the wash - a decision which would not be accepted today. After the last two Port River Interstate Championships having been affected by the weather and boats, there were calls for the South Australians to host the event at Murray Bridge in future. 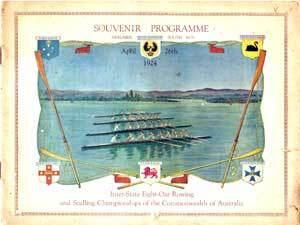 The women's fours race saw a near full field but South Australia was dominant from the start again.